I am thrilled to have Savannah back on the blog today. You may recognize her from her last post on how to curb your spending habits with a spending freeze. 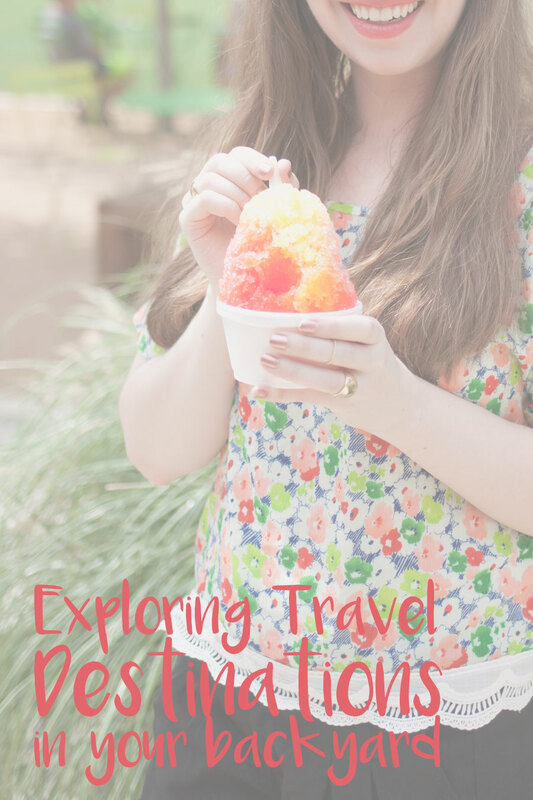 She shared this fun idea for a post – exploring travel destinations in your own backyard – and I thought it was perfect for those who are trying to sneak one last vacation in but may be on a budget. Who says you can’t take a vacation in your own town, right? Read on for a few of Savannah’s suggestions! You don’t have to romp around the world to create unforgettable summer memories. This list will explore some awesome activities that you can likely find right in your neighborhood. Good thing, because I probably couldn’t afford yachting in the south of France this summer anyway. Chances are, you haven’t checked out the museums in your city or nearby metropolitan area. Why would you? They’re not as famous as, say, the MOMA. They can’t be any good, right? visitors have thought of each one. Choose the one that speaks to your interests, whether you love art, natural science or history. What to wear: Perhaps the best thing about perusing a local museum is that you can wear something a bit out of the ordinary as you contemplate paintings or watch indigenous bug species burrow into the dirt. Try, for example, a crocheted romper and some Oxford flats to look equal parts stylish and sophisticated. City-dwellers and country folk alike need changes of scenery. A great way to spend an afternoon – or a weekend, if you want to try camping — is to explore the nearest state or national park. Many parks provide free entry, which means this is one travel destination that’s easy on the wallet. It’s also easy on the mind, as getting out into nature can clear your head and leave you feeling refreshed. What to wear: Packing or preparing for your outdoor trip will be easy, too. Slip into a pair of patterned leggings and top it off with a breathable tee. You’ll be photo-ready when you hike your way to the top of a mountain or stroll alongside a babbling brook. Not all staycations have to be completely budget-friendly and, like I said, the south of France was just out of my reach this year. If you’re in the same boat as I am — pun intended — then treat yourself to an afternoon or day at a local spa. This is another time when online reviews and recommendations from friends come in handy. You want your day of pampering to be as close to perfect as possible, right? Check out local resorts and casinos because they often house spas with day passes so you can access relaxing pools and saunas in between your massage and facial. What to wear: As an added bonus, you can wear just about anything to your spa day because you’ll be lounging in a robe for most of it; cute, comfy sweatpants will get you from the car to the massage table. The ultimate staycation will have you exploring the very city in which you live, but as a tourist would. This means you have to be ready to shirk your city-slicker persona for an afternoon as you partake in a hop-on-hop-off bus tour or architectural boat cruise, for example. However, you might relish in this opportunity, especially if you’re not an actual native of the city in which you live. You can extend your touristic pursuits into famous restaurants and bars, too. What to wear: As you sightsee, wear something breezy and versatile to get you from daytime walking tours to drinks at dusk. A wide-leg jumpsuit would be perfect for this sort of occasion. You don’t have to love sports to love sporting events. There’s much more spectacle when you go to a minor league baseball game than when you watch a major league game on TV. Find out if there are any minor league or professional teams near your hometown. In between innings, there will be games played by fans and prizes thrown into the crowd. Of course, there’s also stadium food. Who doesn’t love hot dogs, pretzels, and nachos? What to wear: If you don’t have any team apparel, try donning a baseball tee with just enough spirit. Pick up some merchandise after the game ends and you realize you’ve become a fan. There are many options for exploring that don’t include a high-priced flight or complex itinerary. Explore your city, discover its hidden gems and learn about your area’s history for some close-to-home entertainment and excitement. Have you ever taken a staycation in your own city? What are some of your favorite destinations in your hometown or where you live now? So glad you enjoyed, Portia! Staycations are often the best because you don’t have to deal with some of the annoyances of travel! So true! Hope you get to enjoy a staycation soon, Brittany! my city doesn’t have much to offer, to be honest, but we are close to a few bigger cities that we could make a little day trip out of it. thanks for the inspiration! So glad you enjoyed, Aishwarya! I love exploring my backyard! I work for a local magazine that’s all about where I live (Westchester Magazine), so it’s easy to discover new places I want to visit and new restaurants! I’ve gone to so many cool and interesting places because of my job, but I love the tips about going to museums! Definitely need to do that! Great Post Jenn, love these ideas, thanks for sharing! So glad you enjoyed, Valerie!